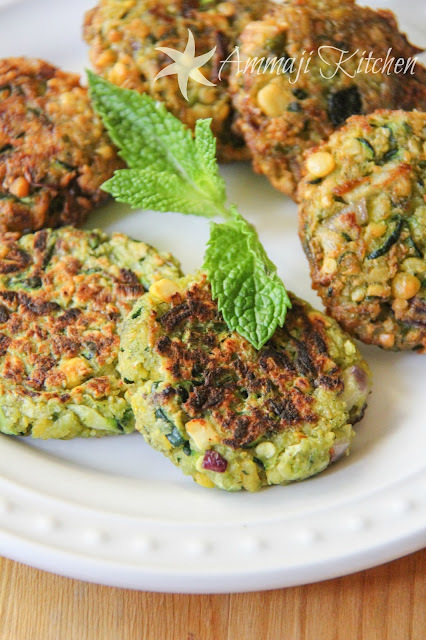 Zucchini Masala Vada is a spicy traditional vada made with Zucchini or Summer Squash along with chana dal and other added ingredients. This recipe was in my draft for months & finally today I was able to press the publish button for this dish. As mentioned I made them long back ago for a magazine. My mom was visiting us in USA & she helped me in making this dish. This deep-fried masala vada's are so delectable that you can never stop from munching on more of these. For a healthy version you can shallow fry or pan fry to enjoy them without any guilt. 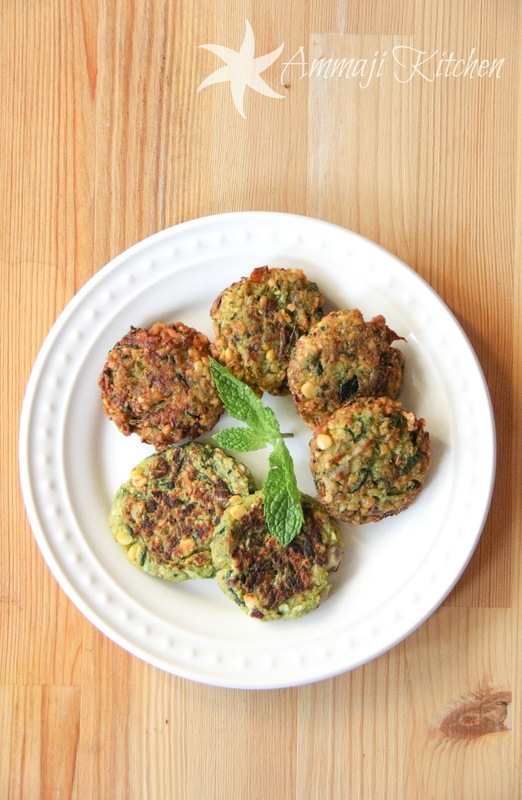 We enjoyed these masala vada's a lot & I hope you would too. 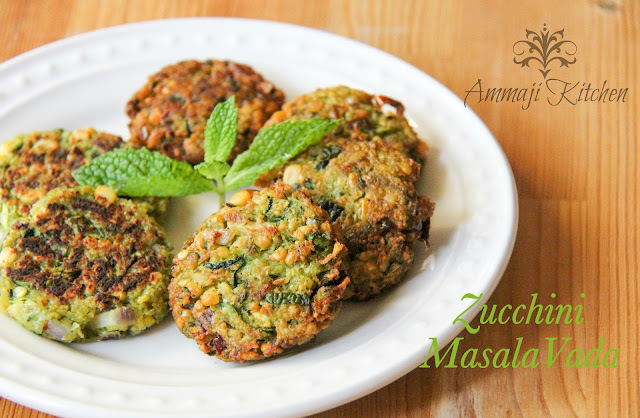 You can accompany these Zucchini masala vada's along with a cup of your favorite drink for a relaxed evening. - Soak chana dal for minimum of 2hrs. - Grate Zucchini & add a pinch of salt to it. Leave for 10mins. Use a cheesecloth to squeeze out extra water & keep aside. - Grind garlic, ginger & green chili’s. To that add chana dal & mint. Coarse grind the mixture. - Transfer it to a bowl along with salt & onions. Mix them well. - Heat oil for deep-frying. Take a scoop of dal mixture & make a patty out of it. - Drop it slowly into oil & add in another few patties to oil. Don't over crowd the pan. Fry them crisp on both sides. - Place them on to a kitchen towel to remove extra oil out of them. Repeat the same with rest of the dal mixture. - Serve them with ketchup or with your favorite chutney. - You can shallow fry or pan fry theses vada’s. They may not be as crisp as deep-fried one’s but tastes awesome & sure are healthy. 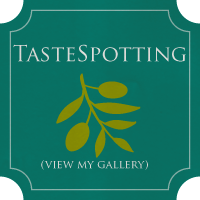 Follow me on "Facebook", "Google+", "Pinterest", "Twitter", "Instagram" for daily updates. Leave me a comment on any queries regarding this recipe & I will be able to answer it for you as soon as possible.